This feast has got very ancient origins and it is just related to a fact occurred many centuries ago. Since the dawn of the history of Venice on the Day of the Purification of Mary on the 2nd of February, it was the custom to consecrate all the marriages on one day and in the Episcopal seat of the time: St. Peter di Castello Cathedral. On the same day the marriages of twelve poor girls were consecrated: for such occasion they were sumptuously dressed and bejewelled, sometimes even with the jewels (borrowed) of the treasure of St. Mark. Just during one of such celebrations, probably in the year 973, the area was attacked by some pirates who abducted the brides with their jewels. People soon hastened to rescue and get back the precious jewellery and they victorious came back. And it is just in honour of such victory on the pirates that the Feast of the Marie was initiated, establishing the draw of the twelve young girls among the most beautiful ones and belonging to the low social classes, as well as the draw of the aristocrat families that would see to their dressing up for the occasion. Once they were ready, on the established day, they reached the chief churches in Venice, while escorted by a procession of boats, in order to attend solemn religious ceremonies. Anywhere they went many refreshments with music and dancing were arranged, as the fact of approaching them was considered as a good omen. The importance of such feast, which during the years came to last even nine days, was so remarkable that it attracted many strangers too, who used to hasten in order to have the opportunity of admiring the wonderful girls. Just because the Venetians, and as above mentioned, not only Venetian people were more interested in courting the brides rather than watching the religious ceremonies, later they were replaced with not so desirable wooden statues. 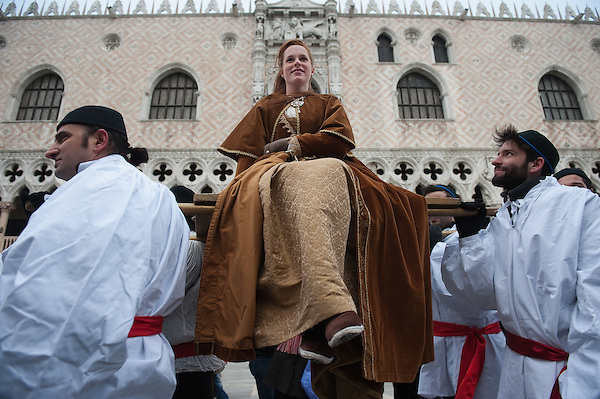 Obviously the male population reacted disdainfully and angrily because of such replacement, so that the Republic was obliged to issue, in 1349, a law which forbade the throwing of vegetables at the Procession of the wooden Marie! !